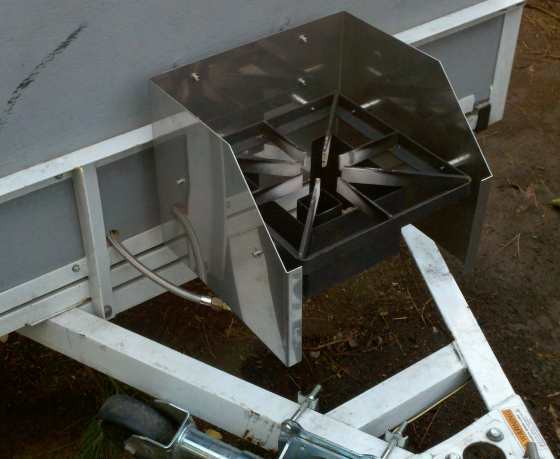 Here's the most recent mod to the bbq trailer - a Cajun Shoppe propone burner. It a custom build using their 12" Bull Dog frame with no legs and a Jet Burner instead of a high pressure cast. It gets a chimney of coals started in record time. Boils a 20 quart pot in 20 minutes, and it sounds like a jet engine taking off. I can't wait to do a Low Country Boil on this bad boy. The stainless Steel work is something I had fabricated for this project. It shields the flame from wind and mounts the burner too - truth is it's the most expensive part of the project. It cost $150 and that was a real bargain.